The Celestron Heavy-Duty Alt-Azimuth Tripod is really useful when you want to do hand’s-free viewing through giant binoculars or a spotting scope. It is also a nice match for small to medium-sized telescopes, like the Celestron C90 or C5. 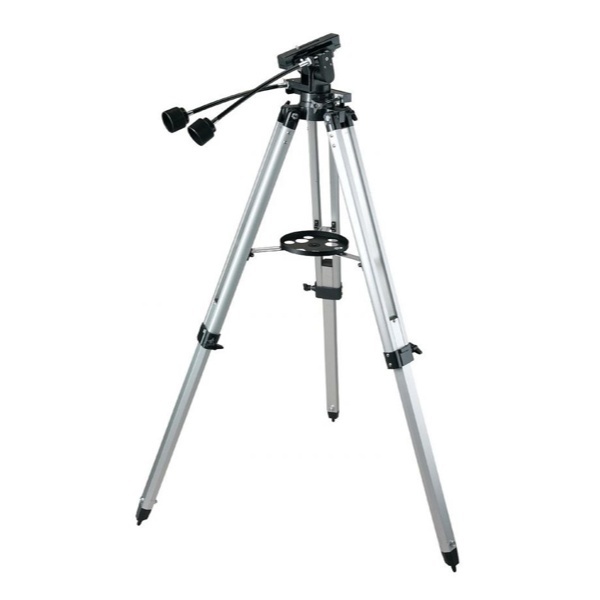 The aluminum legs of the Celestron Heavy-Duty Alt-Az Tripod are fully adjustable to best match the height you require. Minimum height is 32 inches, and the maximum extended height is 45 inches. A center brace stabilizes the legs in place when the tripod is open, and a metal accessory tray is fitted to the center of the brace, or spreader bars, allowing you to store a few accessories close at hand. The alt-azimuth tripod head is made of metal and is controlled in two ways. To make large adjustments in altitude, simply grab the mount and move it to the desired location. A friction clutch installed in the head will hold it in position. Large movements in azimuth can be achieved by loosening the azimuth lock and then manually moving the mount. It can spin 360º with the lock disengaged. Small movements are best made by turning the slow motion control handles. They work great for following objects as they move across the night sky. Equipment is mounted on the alt-az tripod head by a 1/4”-20 thread mounting bolt that is captured in the mounting plate. The mounting bolt is free to slide along a slot cut in the mounting plate, allowing the user to adjust the forward and aft location of the telescope, spotting scope, binocular mount adapter, or camera. The purpose here is to keep your equipment centered over the tripod as best you can. Refractor telescopes and cameras with long lenses will be less stable if they sit too far forward, so the ability to make adjustments to the balance point is a nice option. A heavy-duty alt-azimuth mount for use with binoculars, spotting scopes or telescopes. Adjustable aluminum legs provide a minimum height of 32” and a maximum height of 45”. A sliding 1/4”-20 mounting bolt lets you adjust the balance point of your equipment for optimum stability. Make slight adjustments to altitude & azimuth with intuitive slow motion handles. Weigh capacity of approximately 10 pounds.